We offer residents an optional fortnightly green waste bin collection (green bin with an orange lid) for lawn clippings, leaves, weeds and light pruning. The green waste we collect is processed into compost, mulch and soil enhancers. If you have large items, such as tree branches or roots, you can book a bundled green waste collection or drop it off at the Boroondara Recycling and Waste Centre (charges apply). Please note: we don't collect bins on Good Friday, Christmas Day and New Year's Day. 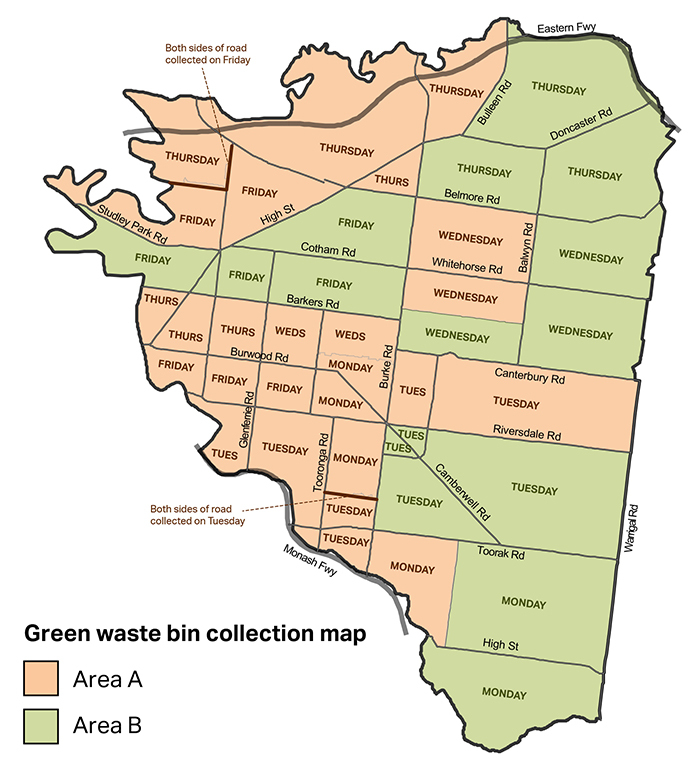 Alternative collections are highlighted on the Green waste bin collection calendars and in the table below. Download the 2019-20 green waste calendar. Check the map below to determine if you live in Area A (orange) or Area B (green). with the bin handle facing your property. Twigs and branches up to 75mm in diameter, cut to fit in the bin. You can order 1 or 2 green waste bins. In 2018-19, each 240 litre bin has a one-off fee of $123. You can pay by filling out one of the forms above, and emailing or posting it to us, or in person at one of our cashiers desks, see payments. For further information, please call us on 9278 4444.